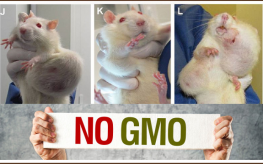 Over 1240 scientist signatories have demanded that a study previously published on the toxic effects of GMO maize and RoundUp that was retracted by the journal Food and Chemical Toxicology (FCT) be reinstated. This is a massive backlash against an industry that has tried to silence well-qualified scientists from publishing the truth about GMOs. These scientists and others plan to boycott Elsevier -a ‘world-leading provider of scientific information – until the journal, FCT, reinstates a study carried out by Gilles Eric Séralini et al., which was been debated throughout scientific and non-scientific circles alike. Professor Gilles-Eric Séralini is a biologist at the University of Caen. He published a study on GMOs which clearly showed how damaging they were to health, and pointing out that “Agricultural GMOs do not exist independently of pesticides.” That study can be found here. Seralini has vowed he will republish his study. He believes the study was only retracted due to lobbyist pressure and the symbolic effect the study would have on the industry. With the retraction of this study (and despite others indicating GMO dangers), companies like Monsanto, the makers of RoundUp chemicals, can say, ‘there has never been a study proving GMOs pose a health risk.’ That is quantifiably wrong. “Our American children have been the unwilling science experiments to GMOs and their health issues have skyrocketed. 1 out of 2 of our children will have Autism in 20 years if we keep going at the rate we are now. Diabetes expenses will eat up all of our federal health care budget in 13 years. Failure to conceive in the US is now at 30%. These and many more health conditions have been linked to GMOs and Glyphosate. Moms Across America are seeing their children get better when they get off GMOs, from autism, allergies, auto immune and asthma. Monsanto cannot suppress us forever. Join the masses who are telling Monsanto we know the truth about their poison crops, and we won’t be suppressed any longer. Seralini’s study needs to be on the front of every major news publication when it is republished. The biotech trolls should have a heyday trying to shoot it down a second time.